The Pencil tool is for drawing the final images, such as character nodes, cut-out puppet and clean animation. The pencil creates a central vector shape. The Brush tool takes account of pressure sensitivity, allowing you to create lines with variable thicknesses when using a pen tablet, creating a contour vector shape. You can set different parameters, such as the size and smoothness of the Brush tool in the Tool Properties view. If you draw with the Brush tool and want to modify the thickness variation, use the Contour Editor tool. 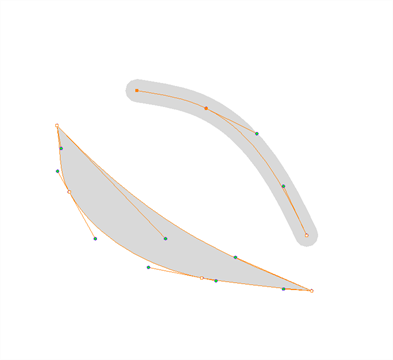 The Pencil, Polyline and Shape tools let you create a central vector line of uniform thickness. Pressure sensitivity is not supported with pencil lines. You can set different parameters, such as the size and smoothness of the Pencil tool in the Tool Properties view. NOTETo learn more about the Pencil tool options, see Pencil Tool Properties.